Alter The Press! 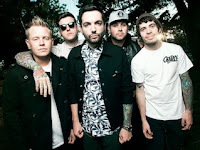 : A Day To Remember Perform New Song "Dead And Buried"
A Day To Remember Perform New Song "Dead And Buried"
Check out a fan-shot video of A Day To Remember performing a brand new song titled, "Dead And Buried" at their show in Broomfield, CO last night (September 12th) below. The track is expected to be taken from the band's upcoming album Common Courtesy, which drops October 8th. ADTR are currently touring across the country alongside All Time Low and Pierce The Veil. Remaining dates and ticket information can be found here.